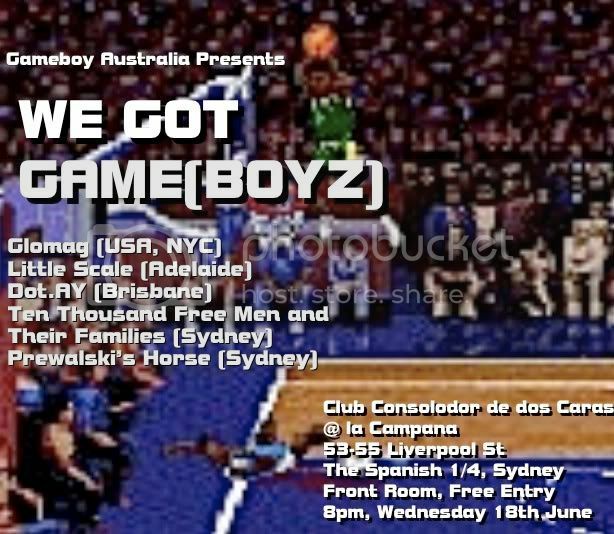 Game Boy Australia: GAME BOY AUSTRALIA PRESENTS: We Got Game(boyz). Come along and witness the most badass show Sydney has seen in a long while. This Wednesday night, the 18th of june, at 'Club Consolador De Dos Caras', which can be found at la Campana, 53-55 liverpool st, the spanish 1/4, Sydney. Obviously, we found out that Glomag was in the country, and knocked this up pretty quick. Maybe we'll get flyers out next time. But c'mon... GLOMAG!!! More info about the whole night can be found here. More on Glomag here & here. Updated: added Little-Scale to the line-up. AWESOME! See you guys soon. Thanks for getting this together. Not a worry in the world man. You better be coming out with us post gig! I'll see everyone in a few days!! Can't wait to play and hang out with you guys.